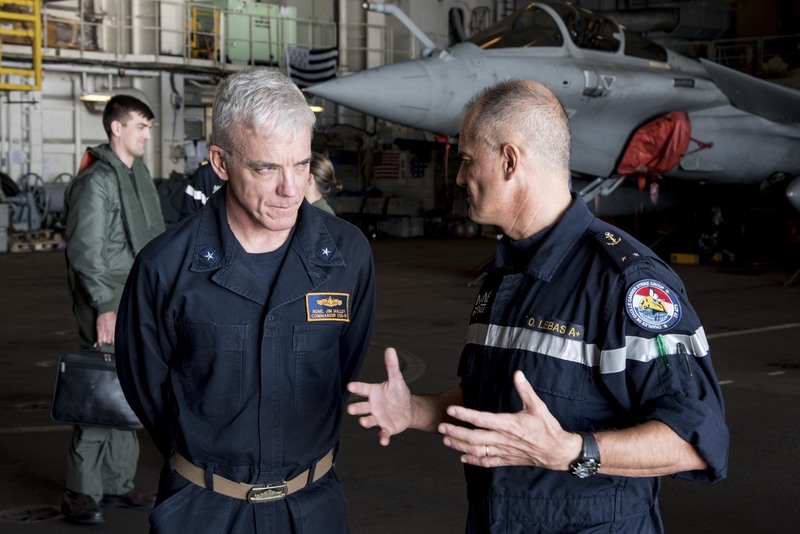 French Rear Adm. Olivier Lebas, right, commander, Task Force 473, speaks with Rear Adm. James Malloy, commander, Carrier Strike Group (CSG) 10, on the aircraft carrier FS Charles de Gaulle (R91). US Navy photo. A Navy vice admiral has landed in Bahrain on temporary duty with U.S. 5th Fleet and U.S. Naval Forces Central Command, after the previous commander was found dead in his home over the weekend from an apparent suicide. Vice Adm. James Malloy, deputy chief of naval operations for operations, plans and strategy (N3/N5), is in Bahrain on temporary duty and will likely take interim command of naval forces in the Middle East, multiple Navy officials told USNI News. Though Malloy’s background has a heavy emphasis on this region and he is considered a subject matter expert, it is unclear at this time how and when the Navy will go about selecting a permanent NAVCENT/5th Fleet Commander and if Malloy would be considered for the job. While Malloy is in Bahrain, the number-two at N3/N5, Rear Adm. Stuart Munsch, will serve on temporary duty as N3/N5 at the Pentagon. Malloy has served as deputy chief of naval operations for operations, plans and strategy since August. The Maryland native and 1986 U.S. Naval Academy graduate has, as a flag officer, also served as deputy director of operations for U.S. Central Command (J3); commander of Carrier Strike Group 10, deploying with USS Dwight D. Eisenhower (CVN-69) in 2016 to CENTCOM in support of Operation Inherent Resolve; and, most recently, vice director for operations on the Joint Staff (J3). 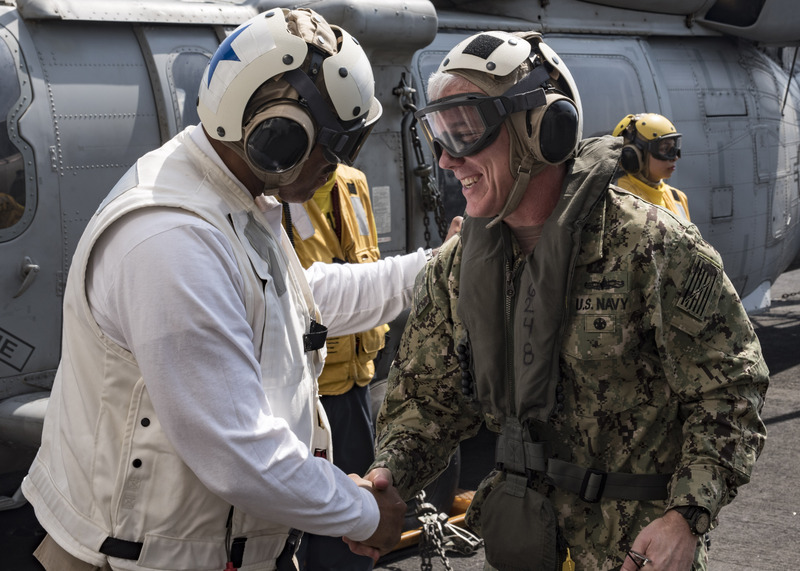 Rear Adm. Jesse Wilson, commander, Carrier Strike Group (CSG) 10, greets Rear Adm. James Malloy, prospective commander, CSG 10, on the flight deck of the aircraft carrier USS Dwight D. Eisenhower (CVN 69) on Sept. 11, 2016. US Navy photo. Earlier in his career, Malloy also commanded minehunter USS Falcon (MHC-59), guided-missile destroyer USS Pinckney (DDG-91) during its maiden deployment, Destroyer Squadron 50 as commander of the Middle East Force (CTF 55), and Coalition Task Group 152.1 operating at sea and from naval command centers in Kuwait, Bahrain and the United Arab Emirates. Immediately following Vice Adm. Scott Stearney’s death on Saturday, deputy NAVCENT/5th Fleet commander Rear Adm. Paul Schlise became the acting commander. Schlise will remain in that acting role until an interim commander is formally approved and put in place. The Navy will eventually have to select a permanent replacement, who will go through a Senate confirmation process before stepping in as the next permanent commander of naval forces in the Middle East.